Сварочный инвертор Monostick 165i | Elko G.C. 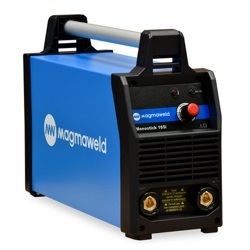 Welding inverter Monostick 165i is a single phase, 230V / 50 Hz inverter MMA (SMAW) welding machine, Excellent arc characteristics with all types of electrodes up to 3,25 mm. Low power consumption, Operates with long power cables and generator sets, Fan cooled and thermally protected against overloading, IP 23S protection class to operate outdoors, Light, easy to carry but rugged design to last tough working and environmental conditions, Standard 3 m (10 ft) in electrode holder and work clamp.